Deltiology is the study or collection of postcards. I am a confessed deltiologist. I have quite a collection of postcards from Wyoming to Atlanta and even the U.K. and Berlin. Every time family or friends take a trip, I ask they send me a post card so I can learn about those places I may never get a chance to visit. In 2011 I have set a goal to collect post cards from all 50 states and learn something about Agriculture from each of those states. I thought this would be a really cool way to learn about Agriculture, and add to my collection. Send me a post card from your state and include an AgFact unique to your area. If it were Arkansas, I might write, “Did you know that Arkansas is the largest rice producer in the U.S.? The state’s farmers produce more than 1,326,377 acres of rice annually. That’s 48% of the national crop!” It does not have to be complicated; just make it something unique. Do not feel like you know a unique AgFact? Then this is a perfect learning opportunity. Send me a direct message on Twitter or Facebook or email me (agricultureproud@hotmail.com) and I’ll give you my mailing address. Be sure to include a return address and I will return the favor with a post card from Arkansas. This is not limited to the U.S. if you are out of the country go ahead and send me a card. I would love to include international Agriculture as well! Invest a dollar for the card, the cost of a stamp, and a trip to the mailbox so we all can learn more about Agriculture across the country. Watch for follow-up posts featuring each postcard I receive. Each state will have one (1) post and when I receive multiple postcards from an individual state, I will update the respective post. 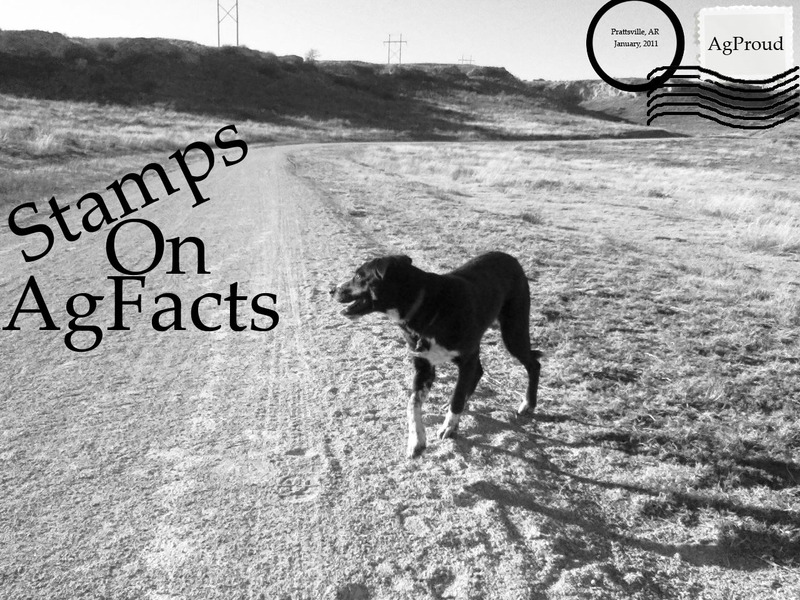 You can view posts in this series by clicking the thumbnail in the right margin or search for “Stamps on Ag Facts”. Keep an eye at www.AgriculutreProud.com for this series of posts.